When you face trials, do you consider it joy as James 1:2 says? I don’t know about you, but I do not consider it joy. I consider it as an opportunity to throw myself a pity party. Not exactly what I am called to do, right? I feel like I have been facing trials non-stop for the past 2 years since my head injury. When trials hit and they hit hard, I find myself asking “why is this happening to me?” or “why is this happening to my child?” The “why’s” come out with a fierceness. In my whys, I begin to feel lonely. I begin to think that I am the only one experiencing whatever it is I am going through. This loneliness leads to negative thought patterns. Negative thought patterns lead to habits of unhealthy thoughts. Sounds much like the dark side doesn’t it? I find this often in motherhood. Motherhood is HARD. Parenting is scary. As much as I love being a mom, motherhood often makes me weary. You have this sweet life under your wings. You are praying that you do it right and don’t completely mess up your kid or cause him/her to require therapy for the rest of their lives. When my child makes a bad choice, I immediately cast the blame on myself. I label myself as a bad mother. My child’s failure is a direct result of my weakness as a mother. The more stressed I am about the situation, the more difficult the situation feels, the less control I feel over the situation…the harder I am on myself. It is in the trials of motherhood that I can cling to Christ and ask for guidance to bring these little hearts to the Lord. It is an opportunity to build character and biblical virtues into my child. It is an opportunity for me to strengthen my relationship with the Lord and with my children. In even the muddiest of puddles, you can find the Lord waiting for you to grasp His hand. Allow God to fill you with peace and truth. Turn to the scriptures and pray. He will give you peace. Allow God to speak hope into your troubled heart. Our hearts can so easily be troubled as we raise our children. We want the best for them and pray that what we are saying and modeling for them is the right thing. Ask God for the right actions and words as you navigate the insane world of raising these little gifts. Remember that you have a manual for life. Turn to the scriptures. It’s ALL in there! You don’t have to have it all figured out. You do your best and you pray, pray, pray for the answers. Expect to fail. Our kids NEED to see this. They will experience failure in their lives at some point. No one is perfect. Show them how to handle failure. Show them what redemption looks like. Don’t allow failure to define you. Because it doesn’t. Our lives are imperfect. It always will be that way. 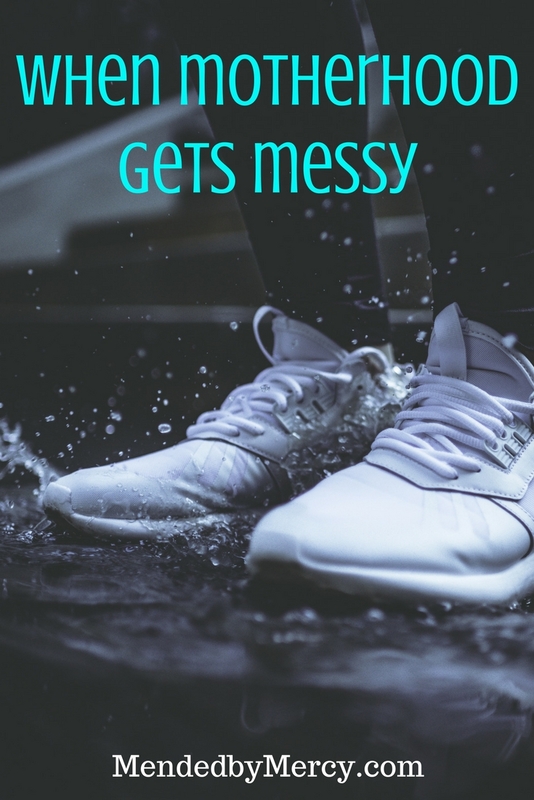 Find wisdom in the untidy places of your life and show your children how to deal with life’s daily mud puddles. You can do this, momma. You won’t always get it right, and that’s okay.